Millions of Americans will be traveling this holiday season, and if it’s anything like previous years, a lot of that travel will be on the road. Last year, AAA estimated that more than 100 million Americans were planning a trip of more than 50 miles during the holidays — and that was just between Dec. 23 and Jan. 1. The recent southeastern snowstorm of December 9 is a reminder that weather can come upon us fast and brutal, so it’s always best to be prepared. Before any long trip, do a thorough check-up. Do wipers need to be replaced? Are your fluid levels where they should be? How’s the radiator and cooling system? If you live in an area (or visit one often) where temperatures regularly drop below 45 degrees, it’s a good idea to get a set of winter tires — they’re better suited for the cold than all-season tires, because they’re designed to provide the best traction and handling in ice and snow. Whatever you’re driving on, however, be sure your tires are inflated properly and that they have enough tread. Your car should have an emergency kit! Pack it with jumper cables, blankets, a first-aid kit, flares, food and water, a flashlight and other safety gear. A shovel and cat litter or sand are nice to have as well. They can provide traction should you get stuck. If you’re going on a trip, make sure you check weather conditions along your route and take printed maps — you may not always have cell reception. Let someone know your itinerary, so if you don’t arrive on time, officials know where to look for you. Are roads snowy or icy? Take it slow. Give yourself extra time to get to your destination, and make sure you leave extra room between your vehicle and others. Watch for ice patches on bridges, overpasses and shady spots. And remember, having four-wheel or all-wheel drive does not mean your car will stop (or steer) better on ice. If you’re caught in a storm that seems like it’s too much for you to handle, seek refuge as soon as you can. Sometimes it’s best not to drive in snow and ice at all — if it looks bad out there, stay home if possible. 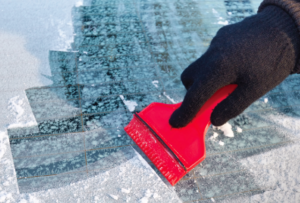 Car trouble and accidents affect thousands of people every winter. If your vehicle is disabled, be sure to stay with it. Run your engine and heater for short intervals, and open one of your windows slightly to prevent carbon monoxide build-up. Light two flares (Remember that vehicle emergency kit? Now’s the time to use it!) and place one a safe distance from both the front and rear of your vehicle. Note your location with mileposts, exit numbers or cross streets and call the authorities or a tow truck. If you’re in a crash, be careful ­– the aftermath of a car accident can be dangerous, especially in winter when visibility might be reduced and conditions might be slick. Check everyone involved for injuries and call 911, if necessary. After minor accidents, have everyone pull well off the road. Put out flares and turn on your hazard lights. Wherever you may be headed this winter, enjoy the season with friends and family. Here’s to a healthy and happy holiday season!